The calibre tag browser is a versatile and powerful tool with some obvious and many obscure but extremely useful features. Today I will discuss some of these features. 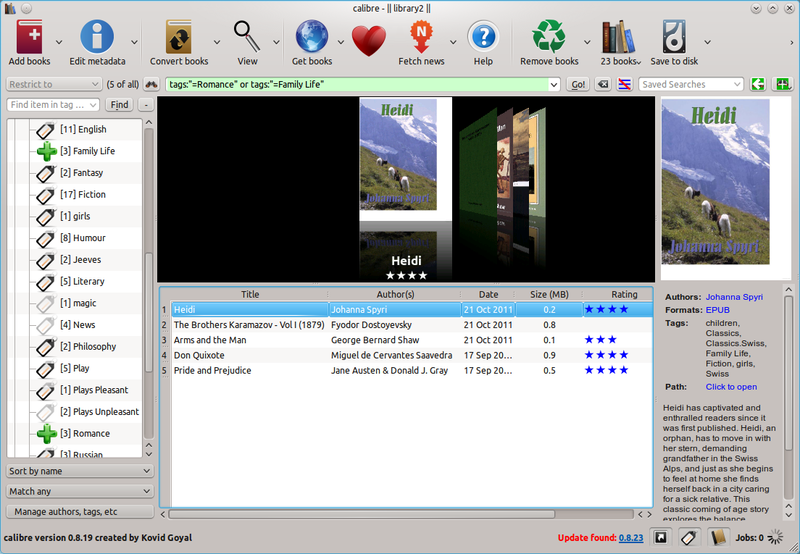 The figure on the left below shows the part of the main calibre window which is the "tag browser". One of the more obscure features I will discuss is how to make subgroups in the tag browser as shown in the portion highlighted in blue on the right figure below. Show ebooks with tag: To explore a particular category in the tag browser, for example "Tags", click the little arrow next to it (Tags) and a list of all the tags will appear. Suppose you are interested in ebooks tagged "Romance" then click on it and a green "+" sign appears next to it indicating that the ebooks now displayed in the main calibre window are tagged "Romance". The tag browser allows you to choose multiple tags simultaneously. For example, while the "Romance" tag has been clicked, if you hold down the "Ctrl" key on your keyboard and select another tag, say "Family Life" then the green "+" sign appears next to both the tags as shown n the figure below. Now at the bottom right corner of the window in the second entry if you see "Match any", then the main calibre window will display all ebooks that have the tag "Romance" as well as all ebooks that have the tag "Family Life" as shown in the figure below. However if you click on "Match any" a menu shows up with another option; namely "Match all". If you select "Match all" then the main calibre window will display only those ebooks that have both tags and unlike the figure below only "Pride and Prejudice by Jane Austen", which has both tags "Romance" and "Family Life" will be displayed. Here you could have chosen the two tags from different categories for example "Humour" (from Tags) and "George Bernard Shaw" (from Authors) and "Match all" to get all ebooks tagged "Humour" by George Bernard Shaw or "Match any" to get all ebooks tagged "Humour" as well as all ebooks by George Bernard Shaw. Show all ebooks w/o tag: Now instead of displaying all ebooks with a particular tag, you may want to display all ebooks that do not have a particular tag. For example, if you want to see all your ebooks except the ones written by George Bernard Shaw, click the little arrow next to the "Authors" category to get the list of authors and then click on George Bernard Shaw. A little green "+" sign appears next to it. Now click again on George Bernard Shaw. This time a little red "-" sign appears next to it indicating that the ebooks displayed in the main calibre library include all your ebooks except those by George Bernard Shaw. By holding down the "Ctrl" key you can select multiple entries. After having eliminated all ebooks by George Bernard Shaw if you hold down the "Ctrl" key and left click twice on "calibre" a red "-" sign appears next to "calibre" as well as shown in the figure below and in the list of ebooks displayed in your main calibre window you will see your entire ebook collection except those authored by either George Bernard Shaw or calibre. 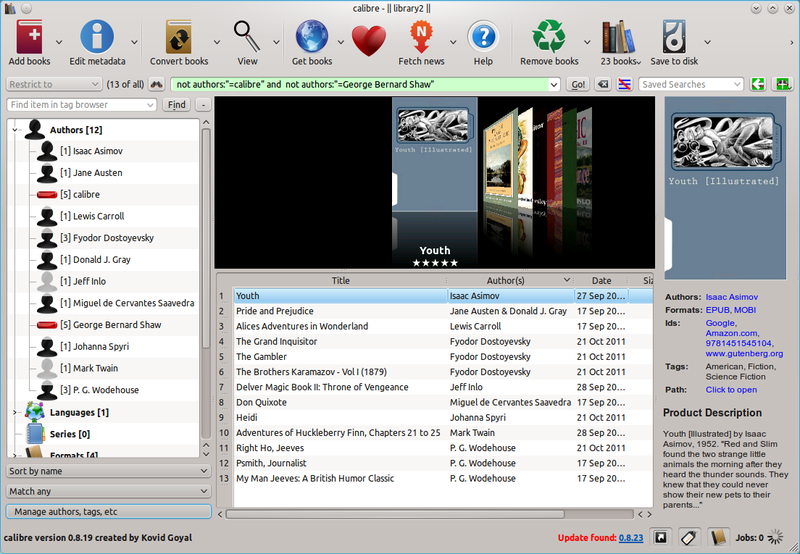 Sorting tags: Calibre allows you to sort the tags in the tag browser in many different ways. 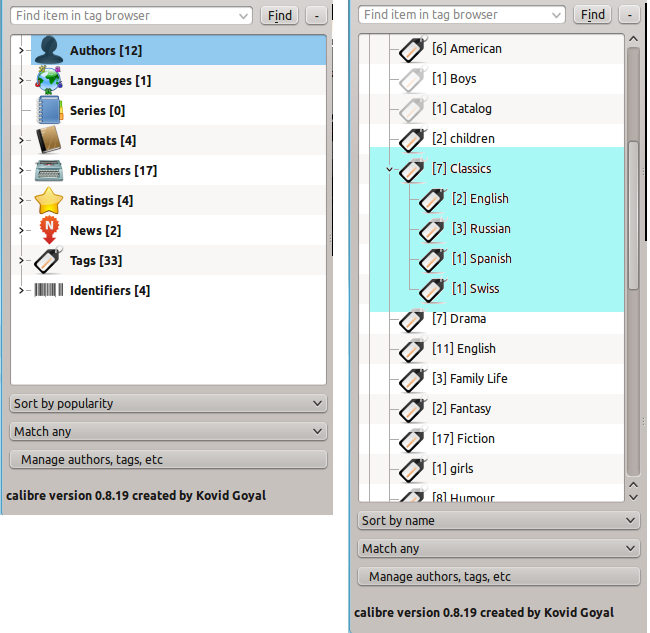 For example the list of authors in the above figure are displayed in alphabetical order of their last names. This is because, the first entry in the bottom left corner is set to "Sort by name". However if you click on it it gives you a menu with a number of options. If you select the option "Sort by popularity" instead, then the authors will be displayed in descending order of the number of ebooks by them in your library. You can also choose "Sort by rating" in which case the authors will appear in decreasing order of their average rating (by stars assigned to their ebooks in the ratings column). Making subgroups of tags: The top figure on the right shows a subgroup of tags to the main tag "Classics". To create such subgroups you need to enable this feature. To do this, go to Preferences -> Look and Feel and click on the "Tag Browser" tab. Here in the field for "Categories with hierarchical items" enter "tags" and click "Apply" in the top left hand corner. Now to actually get hierarchical tags, in the tags section of the metadata entry enter a tag of the form MainTag.SubTag. Like in the top figure on the right and example would be Classics.Russian or Classics.English. Managing categories and tags: If you right click on a particular category in the tag browser a menu appears. The first option allows you to hide the category so you can reduce clutter if you are not interested in it. The fourth option allows you to manage and create user categories. Say, two people John and Joe use the same calibre library. But Joe would like to maintain a separate list of his tags so he only has to search through his own. To do this, right click on a category in the tag browser, choose the "Manage User Categories" option, a new window opens as shown in the left figure below. Enter the title say "Joe's tags" in the right hand top corner and click the green "+" sign. Now you have the new user category called "Joe's tags" that shows up in the left hand top corner as in the figure below. You can now select the tags on the left and use the blue arrow to copy those tags into the "Joe's tags" category. When you are finished with copying the tags click "OK" and now the new category with it's tags appear in the tag browser as shown in the right figure below. Now if you right click on this user category, you willsee an option that allows you to create sub categories. In addition if you right click on any tag in the tag browser, you will see the option to manage tags, that allows you to rename and delete tags. Hope you found this post useful. See you in about a week. great product first of all, incredibly rich in features! is there a way to add yes/no custom columns to the tag browser? it doesn't come up in user categories. Is there a way to select a tag, and then to get the list of authors for that tag, to select from? 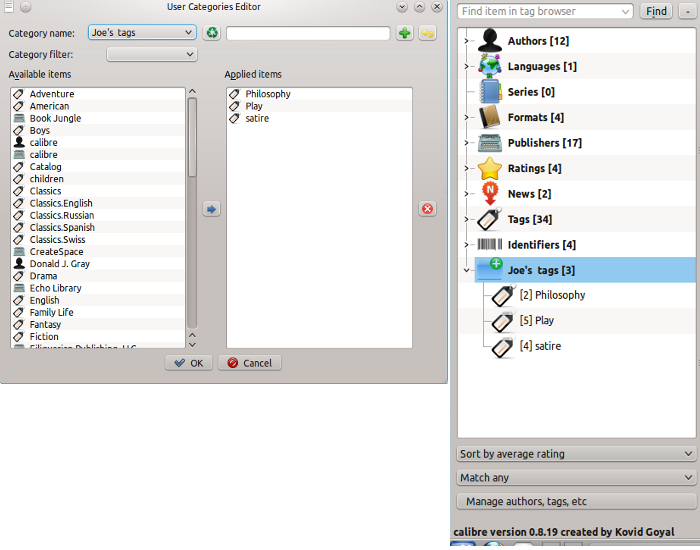 Basically if you make a virtual library of items of a particular tag then the tag browser will display only authors who author books with the particular tag. Is there a way to create a virtual library that shows all books EXCEPT those with a certain tag? So I'd like to exclude books based on tags, and I am hoping that there is a syntax such as "tags:!=myTAG" or "tags:NOT(myTAG)", but I couldn't get this working so far. Is there a way? Any help would be greatly appreciated! Thanks in advance! I found a solution myself and though others might benefit from this reply to my own post. Thanks to the brilliant Kovid Goyal for creating such a feature rich application and also thanks to the smart chaps ander111 and chaley on http://www.mobileread.com. You're awesome! It works, I love this software and the community behind it! I have a tag 'Literature & Fiction', when I select this in tag browser I want language tag to show only the languages I have in my 'Literature & Fiction' collection. Then suppose I select 'English' as a language, I want Author tag to show me the names of authors from my collection, for the books written in English and tagged as 'Literature & Fiction'. Basically I want to have filters and sub-filters applied to search for the books. Is it possible to toggle the tag browser off/on? - specifically, asking about the Mac version of Calibre. Yes. You need to just reduce the windth of the tag browser down till it disappears. If you want it again hust hover your mouse on the middle of the left edge of the main window and a double sided white arrow appears. drag it to the right and your tag browser will eappear. I accidentally hid the "Authors" category from the Tag Browser in Calibre. (I guess I must have right clicked instead of left and wasn't paying attention.) The problem is that I can't figure out how to get it back. I researched the Calibre user manual only to be told how to make a new category, in which it says, "use the User Categories Editor (click the Manage User Categories button) to create a user category". But I can't find either of those things even if I did want to create a NEW Category. What I want is to un-hide (if that's possible) the ORIGINAL "Authors" Category in my Tag Browser. HELP! Is there a way to integrate Alfred 2 with Calibre ? WHere are Calibre's tgas stored (which directory) ?